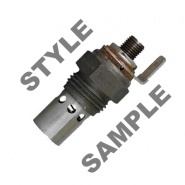 0-130-75 Durite 10.5V Heater Glow Plug M10 x 1.25 Pre-Heat 6 Sec. Nut: 12mm, thread: M10 x 1.25, pre-heat: 6 seconds, volts: 10.5, overall length: 81mm and element length: 22.5mm. Glow and heater plugs for 12V and 24V circuits for diesel starting. 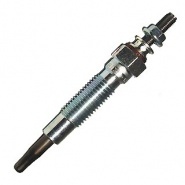 The section covers various style replacement glow plugs and heater plugs, all are quality replacements for Beru, Bosch, Champion, Lucas, Marelli, NGK and HKT. The glow and heater plugs range cover replacement elements for many vehicle makes and manufacturers. 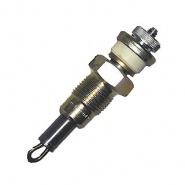 0-130-12 Durite 12V Heater Glow Plug M10 x 1.00 Pre-Heat 17 Sec. Nut: M12, thread: M10 x 1.00, pre-heat: 17 seconds, volts: 12, amps: 8A, overall length: 97mm and element length: 28mm. 0-130-17 Durite 12V Heater Glow Plug M10 x 1.25 Pre-Heat 6 Sec. Nut: M12, thread: M10 x 1.25, pre-heat: 6 seconds, volts: 12, amps: 9A, overall length: 88mm and element length: 22mm. 0-130-21 Durite 24V Heater Glow Plug M10 x 1.25 Pre-Heat 6 Sec. Nut: M12, thread: M10 x 1.25, pre-heat: 6 seconds, volts: 24, amps: 6A, overall length: 95mm and element length: 28mm. 0-130-26 Durite 12V Heater Glow Plug M10 x 1.25 Pre-Heat 6 Sec. Nut: M12, thread: M10 x 1.25, pre-heat: 6 seconds, volts: 12, amps: 10.5A, overall length: 81.5mm and element length: 22.5mm. 0-130-31 Durite 24V Heater Glow Plug M10 x 1.25 Pre-Heat 6 Sec. Nut: M12, thread: M10 x 1.25, pre-heat: 6 seconds, volts: 24, amps: 7A, overall length: 71.5mm and element length: 19mm. 0-130-36 Durite 11V Heater Glow Plug M10 x 1.25 Pre-Heat 6 Sec. Nut: M12, thread: M10 x 1.25, pre-heat: 6 seconds, volts: 11, amps: 10.5A, overall length: 80mm and element length: 18.5mm. 0-130-52 Durite 11V Heater Glow Plug M12 x 1.25 Pre-Heat 6 Sec. Nut: M12, thread: M12 x 1.25, pre-heat: 6 seconds, volts: 11, overall length: 74mm and element length: 28mm. 0-130-57 Durite 11V Heater Glow Plug M12 x 1.25 Pre-Heat 6 Sec. Nut: M12, thread: M12 x 1.25, pre-heat: 6 seconds, volts: 11, overall length: 59.5mm and element length: 24.5mm. 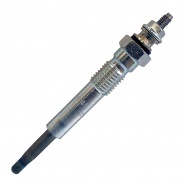 0-130-63 Durite 11V Heater Glow Plug M10 x 1.25 Pre-Heat 6 Sec. Nut: M12, thread: M10 x 1.25, pre-heat: 6 seconds, volts: 11, overall length: 85mm and element length: 18mm. 0-130-65 Durite 12V Heater Glow Plug M10 x 1.25 Pre-Heat 6 Sec. Nut: M12, thread: M10 x 1.25, pre-heat: 6 seconds, volts: 12, overall length: 65.5mm and element length: 18mm. 0-130-81 Durite 12V Heater Glow Plug M10 x 1.25 Pre-Heat 12 Sec. Nut: 12mm, thread: M10 x 1.25, pre-heat: 12 seconds, volts: 12, overall length: 68.5mm and element length: 16mm. 0-130-85 Durite 12V Heater Glow Plug M10 x 1.25 Pre-Heat 6 Sec. Nut: 12mm, thread: M10 x 1.25, pre-heat: 6 seconds, volts: 12, overall length: 86.5mm and element length: 24mm. 0-130-93 Durite 12V Heater Glow Plug M10 x 1.25 Pre-Heat 6 Sec. Nut: 12mm, thread: M10 x 1.25, pre-heat: 6 seconds volts: 12, overall length: 95mm and element length: 28mm. 0-131-02 Durite 1.7V Heater Glow Plug M14 x 1.25 Pre-Heat 17 Sec. Nut: 17mm, thread: M14 x 1.25, pre-heat: 17 seconds, volts: 1.7, overall length: 101mm and element length: 19mm. 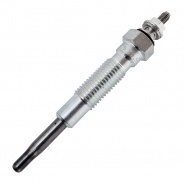 0-131-04 Durite 0.9V Heater Glow Plug M18 x 1.50 Pre-Heat 17 Sec. Nut: 21mm, thread: M18 x 1.50, pre-heat: 17 seconds, volts: 0.9, overall length: 87.5mm and element length: 27.5mm. 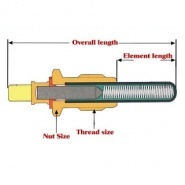 Nut: 24mm, thread: 7⁄8″ x 14 UNF, Volts: 12, Cm3/min: 7-10 and termination: 3⁄8″ blade. Nut: 24mm, thread: 1⁄2″ BSP, volts: 11.5, Cm3/min: 7-12 and termination: 10 x 32 UNF. 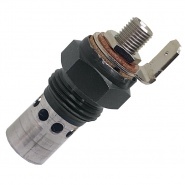 Nut: 24mm, thread: 7⁄8″ x 14 UNF, volts: 11.5, Cm3/min: 3.5-5 and termination: 10 x 32 UNF. Nut: 24mm, thread: 7⁄8″ x 14 UNF, Volts: 23, Cm3 per min: 11-15 and termination: 10 x 32 UNF. Nut: 24mm, thread: 7⁄8″ x 14 UNF, volts: 11.5, Cm3 per min: 2-3.2 and termination: 3⁄8″ blade. Nut: 24mm, thread: 7⁄8″ x 14 UNF, Volts: 11.5, Cm3/min: 3.5-5 and termination: 3⁄8″ blade. Nut: 24mm, thread: 1⁄2″ BSP, Volts: 23, Cm3 per min: 11-15 and termination: 3⁄8″ blade. 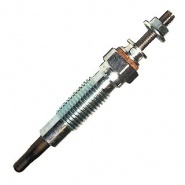 0-132-17 Durite 11.5V Heater Glow Plug M10 x 1.00 Pre-Heat 5 Sec. Nut: 10mm, thread: M10 x 1.00, pre-heat: 5 seconds, volts: 11.5, overall length: 128mm and element length: 27.5mm. 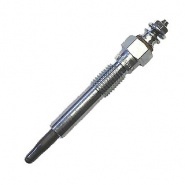 0-132-31 Durite 11V Heater Glow Plug M10 x 1.00 Pre-Heat 5 Sec. Nut: 10mm, thread: M10 x 1.00, pre-heat: 5 seconds, volts: 11, overall length: 150mm and element length: 24mm. 0-132-32 Durite 11V Heater Glow Plug M10 x 1.25 Pre-Heat 6 Sec. Nut: 12mm, thread: M10 x 1.25, pre-heat: 6 seconds, volts: 11, overall length: 77mm and element length: 18mm. 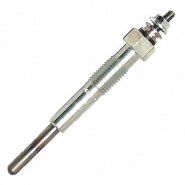 0-132-39 Durite 5V Heater Glow Plug M10 x 1.00 Pre-Heat 3 Sec. 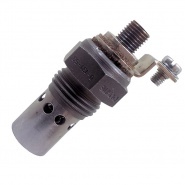 Nut: 10mm, thread: M10 x 1.00, pre-heat: 3 seconds, volts: 5, overall length: 97mm and element length: 29mm. 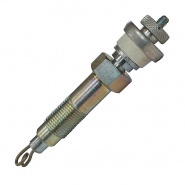 0-132-40 Durite 5V Heater Glow Plug M10 x 1.00 Pre-Heat 3 Sec. Nut: 10mm, thread: M10 x 1.00, pre-heat: 3 seconds, volts: 5, overall length: 106mm and element length: 32mm. 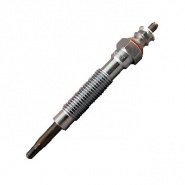 0-132-41 Durite 4.4V Heater Glow Plug M8 x 1.00 Pre-Heat 3 Sec. Nut: 8mm, thread: M8 x 1.00, pre-heat: 3 seconds, volts: 4.4, overall length: 117mm and element length: 29.5mm. 0-132-42 Durite 4.4V Heater Glow Plug M10 x 1.00 Pre-Heat 3 Sec. Nut: 10mm, thread: M10 x 1.00, pre-heat: 3 seconds, volts: 4.4, overall length: 127mm and element length: 24mm.